Hey boys and girls! After a week of competition, we found out that week was way too short time for this kind of competition, thus we’re extending it a bit. Our new deadline is end of the month – 00:00 CET, Sept 1st. This means you have to have them submitted as the month changes. We hope this helps a lot of our loyal fans with their submissions, so keep the entries rolling in! Thanks to everyone who has already submitted their entries! For the details of the competition, head over to the original competition post found HERE, just disregard the date in that post! PROSTITUTE DISFIGUREMENT and SOLACE OF REQUIEM confirmed as support bands! 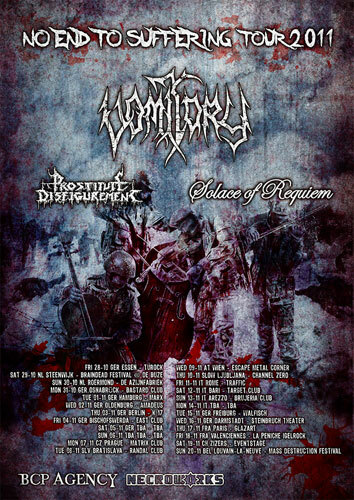 Swedish Death Metal warriors VOMITORY have confirmed to play a full headline tour through Europe in October and November. The trek kicks off October, 29th in Essen, Germany. Spread the word! VOMITORY released their latest album Opus Mortis VIII in April of 2011. The limited first edition is a Digipak featuring four exclusive bonus tracks. Those tracks are re-recorded versions of songs taken off the first two VOMITORY albums. Check out VOMITORYs video clip for the album opener Regorge In The Morgue at THIS location! Classic rock outfit GRAVEYARD is nominated for the best album of the year with ”Hisingen Blues“ by Classic Rock magazine’s Roll Of Honour! To let the band and their masterpiece receive this well-deserved award, please participate in the voting HERE! Furthermore, the re-release of their debut ”Graveyard“ is available since last Friday. Seeing the big success of their second record “Hisingen Blues”, the band as well as the label decided to re-issue their stunning and nowadays hard-to-find self-titled debut album which gained a lot of attention in the underground on its initial release back in 2007. 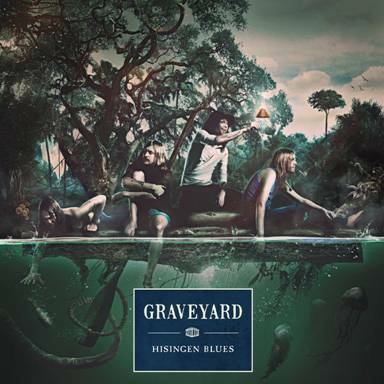 The album contains all tracks of the original release also featuring the original sound to experience the true and pure essence of GRAVEYARD – even a bit rawer than what you know from their current masterpiece “Hisingen Blues”. HELL, Is getting closer and it´s time to get the message out!! For all of you who have missed the introduction to HELL, here´s another chance to get a glimpse of what’s to come on september 9-10, when Engel and Hellmans Drengar will perform Engel songs, both classics and newly written anthems which will be heard within weeks. This is something unique and a fresh taste of what HELL is like. Can be viewed below. For those of you who haven’t got a hold of you tickets yet, go HERE to get them! Timo Jelencovich, the younger brother of former MNEMIC and current M.A.N/TRANSPORT LEAGUE frontman Tony Jelencovich, was found dead yesterday (Saturday, August 20) at 6 p.m. in Bergsjön, a district in eastern Gothenburg, Sweden. It is suspected that he was murdered, thrown to his death from the balcony of a sixth-floor apartment. One person has already been arrested in connection with the incident and several witnesses have been interrogated. More information (in Swedish) can be found in this article from Göteborgs-Posten.